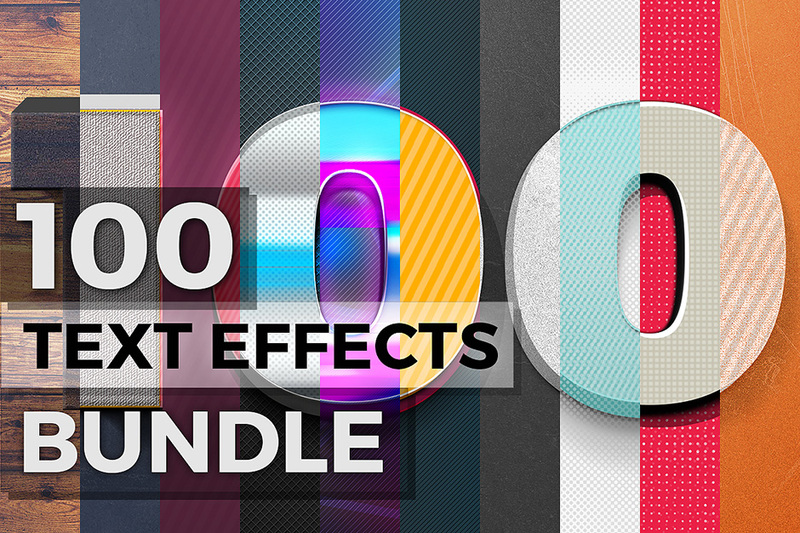 We decided to bundle all of our text effects in one big pack because we know how much everyone likes a good deal! And on top of it all, we added 2 extra items for free! Software compatibility: Adobe Photoshop CS4 and newer or Photoshop CC. Please note this product does not work with Photoshop Elements. This resource includes our extended product license. Please see full license details here. File size is approx 4.1GB unzipped, offered as a 3 part download. Is there an instructional video somewhere on how to use this effects pack? Are these actions that are easily applied to any font I chose or if there are fonts that come along (or for download) that I need to use in order for the effects to work? Cheers! So with this pack, there unfortunately isn’t an instructional video but the designer has included a help file for you to get you working as quickly as you can! The designer has included links to the fonts that he has used in the help file as well but you should be able to apply these effects to any font you are working with! I hope that helps and happy designing! Can I use this in Affinity Photo? Has anybody texted if this would work in Affinity Photo? Thank you so much for your comment and I’m so sorry for any confusion caused by the compatibility of our 100 Text Effects + Bonus Items. Rest assured we always list the software compatibility of our products so I’m so sorry if you missed this on our deal page. Unfortunately the software compatibility is completely at the discretion of the designer, and they have advised that this pack is only compatible with ‘Adobe Photoshop CS4 and newer or Photoshop CC. Please note this product does not work with Photoshop Element’, my sincerest apologies for any disappointment caused. I apologise for the novice question, but how do I move the result of my text effect into another Photoshop file? Or even within its own document? For example, I am using 2.psd from the 3D Text Effects Vol 1. folder. I have edited the text and it looks great. But when I try to move it, I’m only able to drag a small part of it, such as the shadow – as it is separated into loads of different layers. I’ve tried linking the layers but when dragging it to another document it ends up looking different. And merging the layers which again changes the look of the text (and also doesn’t allow for future editing). I am so sorry that you are having trouble with your 100 Text Effects!